The second Antietam (CV-36) was laid down on 15 March 1943 by the Philadelphia Navy Yard; launched on 20 August 1944; sponsored by Mrs. Millard E. Tydings, the wife of Senator Tydings of Maryland; and commissioned on 28 January 1945, Capt. James R. Tague in command. The aircraft carrier completed fitting out at Philadelphia until 2 March when she got underway for her shakedown cruise. The ship arrived in Hampton Roads on the 5th and conducted op erations from Norfolk until 22 March when she stood out of Chesapeake Bay bound for Trinidad in the British West Indies. At the conclusion of her shakedown cruise, Antietam returned to Philadelphia on 28 April to begin post-shakedown availability. She completed repairs on 19 May and departed Philadelphia that same day. After a three-day stop at Norfolk, the warship resumed her voyage to the Panama Canal in company with Higbee (DD-806), George W. Ingram (APD-43), and Ira Jeffery (APD-44). She arrived at Cristobal on 31 May, transited the canal the next day, and continued her voyage up the coast. to San Diego. She stopped at San Diego from 10 to 13 June before begin ning the first leg of her transpacific voyage. Antietam arrived in Pearl Harbor on the 19th and remained in the Hawaiian Islands conducting training missions until 12 August. On that day, she shaped a course for the western Pacific. Three days out of Oahu, she received word of the Japanese capitulation and the consequent cessation of hostilities. Thus, by the time of her arrival in Eniwetok Atoll on the 19th, her mission changed from combat to occupation support duty. On the 21st, she exited the lagoon in company with Cabot (CVL-28) and a screen of destroyers bound for Japan. En route, she suffered some internal damage which forced her into port at Apra Harbor, Guam, for inspections. The inspection party deemed the damage minimal; and the carrier remained operational, res her course on the 27th. By that time, however, her destination had been changed to the coast of the Asian mainland. She stopped at Okinawa between 30 August and I September and arrived in Chinese waters near Shanghai the following day. The aircraft carrier remained in the Far East for a little more than three years. The Yellow Sea constituted her primary theater of operations while her air group provided support for the Allied occupation of North China, Manchuria, and Korea. During the latter stages of that assignment, her airmen conducted surveillance missions in that area as a result of the civil war in China between communist and nationalist factions which later resulted in the expulsion of Chiang Kai-shek's forces from mainland China and the establishment of Mao Tse-tung's communist Peoples Republic of China. Throughout the period, however, she did depart the Yellow Sea on occasion for visits to Japan, the Philip pines, Okinawa, and the Marianas. Early in 1949, she con- mission in the Orient and headed back to the United States for deactivation. Antietam remained in reserve at Alameda, Calif, until communist forces from the north invaded South Korea in the summer of 1950. She began reactivation preparations on 6 December and went back into commission on 17 January 1951, Capt. George J. Dufek in command. Initially, the carrier conducted shakedown training and carrier qualifications along the California coast, first out of Alameda and-after 14 May-out of San Diego. She made one voyage to Pearl Harbor and back to Sari Diego in July and August before departing the latter port on 8 September and heading for the Far East. Antietam arrived in the Far East later that fall and, by late November, began the only combat deployment of her career. During that tour, she made four cruises with Task Force (TF) 77, in the combat zone off the coast of Korea. In between fighting assignments, she returned to Yokosuka, Japan. During each of those periods, her air group carried out a variety of missions in support of United Nations forces combatting North Korean aggression. Those missions included combat air patrol, logistics interdiction-particularly against railroad and highway traffic-reconnaissance antisubmarine patrols, and night heckler missions. Between late November 1951 and mid-March 1952, Antietam's air group flew nearly 6,000 sorties of all types. She returned to Yokosuka on 21 March 1952 at the conclusion of her fourth cruise with TF 77 to begin preparations for her voyage back to the United States. The aircraft carrier returned home in April and rejoined the Pacific Reserve Fleet briefly. She was reactivated later that summer and, in August, transited the Panama Canal to join the Atlantic Fleet. In September, the warship entered the New York Naval Shipyard for major alterations. In October, she was redesignated an attack aircraft carrier, CVA-36. In December, Antietam emerged from the yard as America's first angled-deck aircraft carrier. She operated out of Quonset Point, R. I., until the beginning of 1955. During the intervening years, she participated in numerous fleet and independent ship's exercises. After August 1953-at which time she was redesignated and antisubmarine warfare (ASW) carrier, CVS-36-Antietam concentrated upon honing her hunter/killer skills. In January 1955, she embarked upon a voyage to the Mediterranean Sea where she served with the 6th Fleet until March. Resuming duty with the Atlantic Fleet ASW forces, she operated along the eastern seaboard until the fall of 1956. In October of that year, she cruised to the waters of the eastern Atlantic for NATO ASW exercises and goodwill visits to ports in Allied countries. While the carrier was in Rotterdam, the Suez crisis broke out in the eastern Mediterranean. Antietam cut short her visit to the Netherlands and headed for the "middle sea" to bolster the 6th Fleet during the evacuation of American citizens from Alexandria, Egypt. At the end of that assignment, she conducted ASW training exercises with Italian naval officers embarked before returning to Quonset Point on 22 December. After resuming operations along the eastern seaboard early in 1957, Antietam was assigned on 21 April 1957 to training duty with the Naval Air Training Station, Pensacola, Fla. Mayport, however, served as her home port because ships of her draft could not then enter port at Pensacola. For almost two years, the aircraft carrier operated out of Mayport training new Navy pilots and conducting tests on new aviation equipment-most noteworthy, on the Bell automatic landing system during August of 1957. She also participated in annual Naval Academy midshipmen cruises each summer. In January 1959, after the deepening of the channel into Pensacola had been completed, Antietam's home port was changed from Mayport to Pensacola. 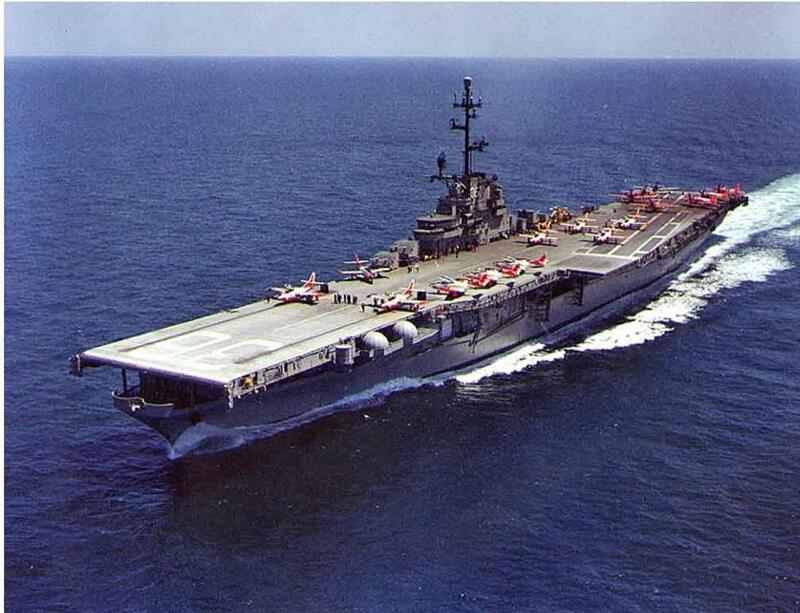 For the remainder of her active career, the carrier operated out of Pensacola as an aviation training ship. On two occasions, she provided humanitarian services to victims of hurricane damage. The first came in September of 1961 when she rushed to the Texas coast to provide supplies and medical assistance to the victims of hurricane Carla. The second came just over a month later when she carried medical supplies, doctors, nurses, and other medical _personnel to British Honduras to help the victims of hurricane Hattie. Otherwise, she spent the final four years of her naval career in routine naval aviation training duty out of Pensacola. On 23 October 1962, Antietam was relieved by Lexington (CVS-16) as aviation training ship at Pensacola and was placed in commission, in reserve, on 7 Jan nuary 1963. She remained in that status un til she was decommissioned on 8 May 1963. Berthed at Philadelphia, Pa., she remained in reserve until May of 1973 when her name was struck from the Navy list. On 28 February 1974, she was sold to the Union Minerals & Alloys Corp. for scrapping. Antietam (CV-36) earned two battle stars for service in the Korean conflict.